Get great discount on Sony Cyber-shot DSC-W710 Point & Shoot Camera | Online India shopping best deals, discount,coupons,Free offers. 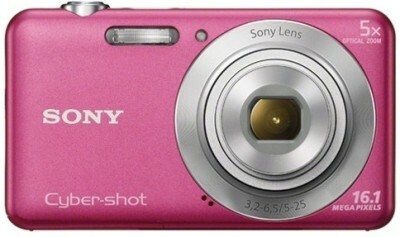 Sensor Technology This Sony Cyber Shot camera is powered by an effective and highly efficient Super HAD CCD sensor with 16.1 MPs. This is a great sensor for low light photography as well, due to the relatively low noise levels it generates. This sensor is also capable of performing remarkably across a wide range of lighting conditions, apart from low light. Zoom Levels This camera has a 5 X optical zoom range that is much more quality conscious than digital zoom options available on other point and shoot cameras. This feature allows you to zoom on the optical input rather than magnifying the digital readout. This eliminates the loss in detail and quality as long as it stays within the optical parameters. Advanced Flash Technology In keeping with the other advanced features of the camera, it also sports an advanced flash that can regulate itself according to the situation prevalent around the subject in focus. The Advanced Flash Technology uses ambient light to gauge the flash intensity necessary for illuminating the subjects. This is a feature that best stands out in the Auto Mode. High Definition Video Recording This camera is capable of taking high definition videos at a resolution of 720 P. This is highly useful for those who like to record their memories and make home movies with them. Beauty Effect This feature allows you to create beautiful portraits with the in-built camera controls. This setting allows you to make the necessary changes to attributes like the colour shades, eyes, skin tone, teeth and other facial features. You can now say goodbye to unwanted blemishes and give new meaning to the term, picture perfect. Picture Effects You can now transform ordinary shots in your camera into beautiful scenes thanks to the Picture Effect Mode available on the Cyber Shot camera for both still photos and videos. Bring out the creative artist in you with the Cyber Shot Camera where various effects can be applied to photos and movies. Other Features This camera sports an Intelligent Auto Mode which recognizes scenes on its own and applies the necessary settings accordingly. You also get a 2.7 inch clear photo LCD screen for previews and also use it as a viewfinder..The product Sony Cyber-shot DSC-W710 Point & Shoot Camera is from the famous brand Sony. The product is currently available with the amazing discount from FlipKart.Currently a discount of 7.0% available for this product. Great discount for this product which has the original price of Rs.6490.0 and you get these amazing products for a discounted price of Rs.5999.0. Hurry up. Stock may be limited.